Sounds crazy, doesn’t it? I got the idea stuck in my head, and it just would not go away. I have learned not to ignore these impulses though. An impulse that would not die is how I ended up with Lemon Spice Brownies after all, so I heeded the call this time too. I’m so glad I did, because these are fantastic! Chewy and peanutty in the middle, crispy on the outside, and they just keep improving as the days go by. I am sure we would have eventually reached some kind of peanut butter cookie nirvana, but we ate them all up before we got there. We better get started, so you can find your own path to enlightenment too. 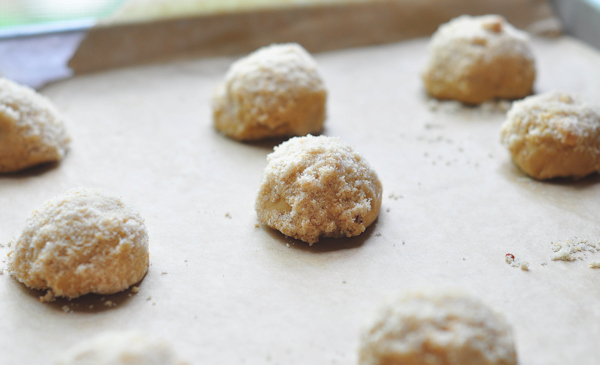 Preheat the oven to 350º and line baking sheets with parchment paper. You can lightly grease the baking sheets if you prefer. 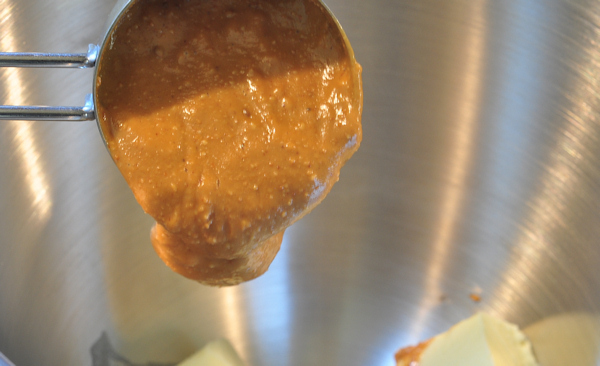 You can do this in a food processor, with a hand blender or minigrinder, which is what I used. 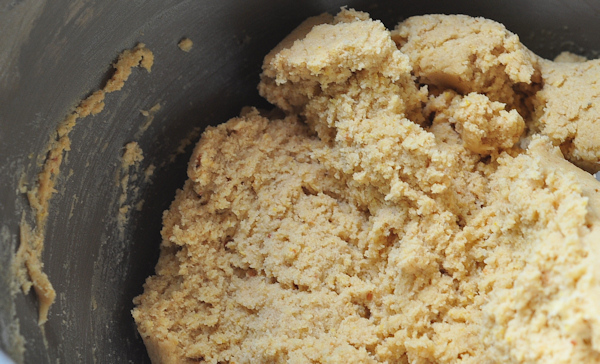 You want the peanuts to be mostly ground to about the texture of coarse cornmeal, but there can be some chunks too. I used a medium cookie scoop emptying it into the palm of my hand and then turning the curved side into the sugar mixture, rolling gently to completely cover the top of the cookie. 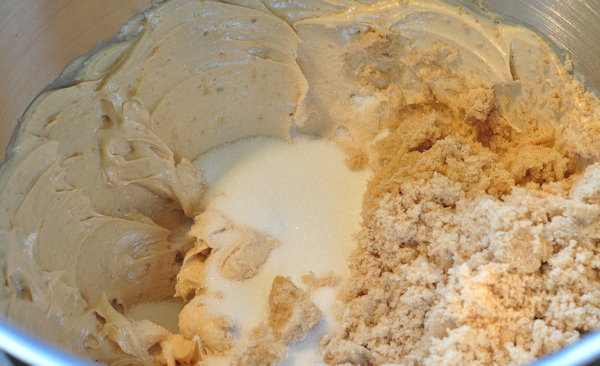 The sugar and peanuts will tend to clump a bit, so fluff it up with fork every couple cookies. The step sounds like more trouble than it really is, and it is so worth the little bit of bother, because this topping is part of what makes these really special. 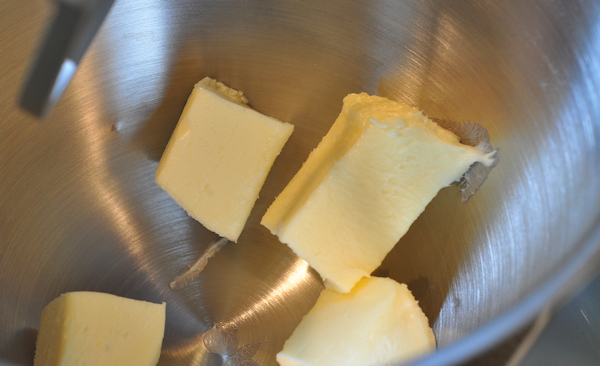 Place sugar side up on the baking sheets, leaving a couple inches clearance all the way around. Bake for right around 12 minutes, until the edges are beginning to brown nicely, but the center is still a bit soft. Remove from the pan and and cool on a rack. Makes about 4 dozen cookies. When you take a bite, you don’t think “cornmeal” necesarily – you just know there is a little something extra in there. The sugary topping, as I said, is so nice, a little finer texture than the sugar right out of the bag, so it melts in your mouth a bit like confectionary sugar does. As I mentioned, these not only keep very nicely in a sealed container, but they actually take on an even nicer texture after a couple days. Provided they last that long of course! And now for a bit of serendipity: Remember Dawn, my partner in Dine & Dish’s Adopt a Blogger project? 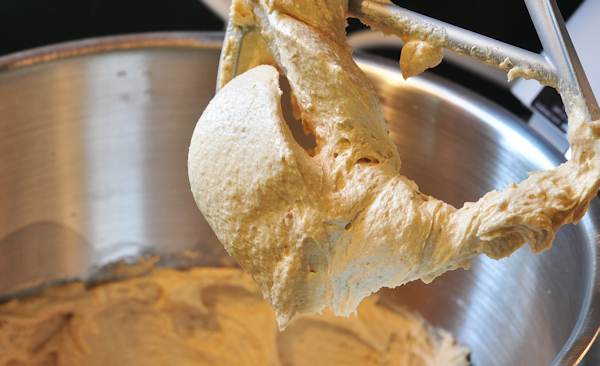 We were talking on the phone the other day and she mentioned she was planning to blog Peanut Butter Cookies today. Since that was my plan as well, we decided to turn it into a group [albeit small group!] project. 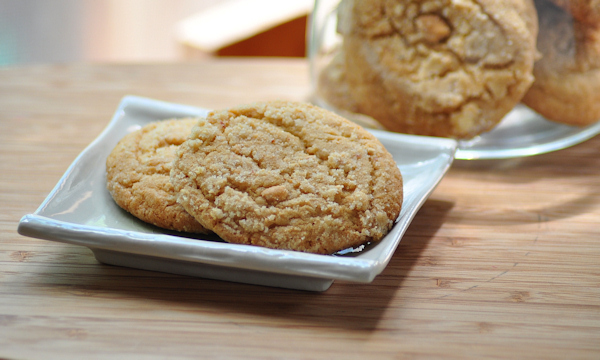 So – go take a look at Dawn’s Big, Super-Nutty Peanut Butter Cookies over at her place! And just as I suspected, she has a trick or two up her sleeve – right after our conversation, I ordered some basic cheesemaking supplies, because she makes that sound super easy. Just what I need – another addiction. does not sound crazy to me. I love experimenting with new flavors & textures. this looks good! Clever! I would never think to use cornmeal in that way. I love peanut butter cookies. Oh those sound so good!!!!!! It’s been years since I made peanut butter cookies. I only use white cornmeal, but I have to say, these look spectacular!!!!!! I thought the title read PB and Oatmeal cookies. Then, after I read the recipe I thought, where’s the oatmeal? WOWWWW I am such a sucker for cookies spread out like that. DEFINITELY going to make this someday!!! Maybe a gluten free version eh? Because, me, the cupcake girl, is actually trying to stay away from processed foods and go au naturale! My husband is making more cookies today. He makes them as soon as we run out. (Damnit). You won the Pay it Forward. I think I have your address but could you give it to me again? 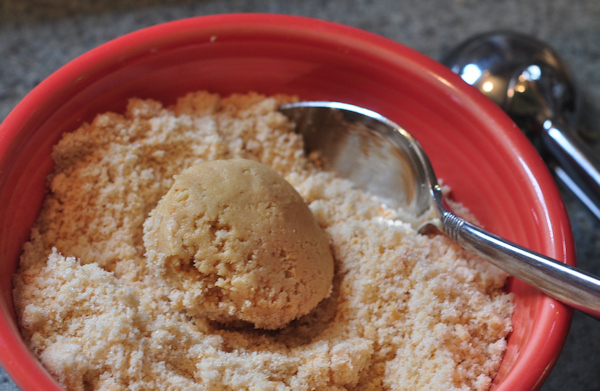 Love the idea of using cornmeal in peanut butter cookies! I would have never thought of it, but it sounds like they would have a nice crunchy texture. I’ve been really into cornmeal lately – these look great! I love cornmeal. I love peanut butter. I love cookies. However, I had to modify this recipe to make it healthier- so I could eat it! I used organic spelt flour instead of all purpose; xylitol sweetener instead of sugar and reduced it to 1/4 of a cup; and coconut oil instead of butter- because it’s so difficult to find unpasteurized butter made from grass-fed cows where I live! Anyway, the recipe turned out great this way! Thanks for the inspiration and figuring out all the tricky measurements! These look awesome. I am planning on trying them soon. I have never heard of cornmeal in cookies before, so when I saw this, I said, I have to check it out. Glad I did, they look wonderful! I will be posting it on my blog with a link return to the post for everyone to see the awesome photos you took. I love food photos.